Yesterday someone tweeted that they were fed up with looking at Christmas food already, so I'm taking the opportunity to give you a little break from feasing your eyes and giving you the opportunity to win a little something to put in your own Christmas stocking. A good read to be enjoyed in those quiet moments after you have eaten all that food. If, by Christmas Day, you’ve had enough ‘festive cheer’ for one year, then fill your stockings with presents with a darker edge. If woolly jumpers, over-indulgent hampers and a box of old-lady soaps are not your thing, then how does ‘A Matter of Life and Death’ sound? 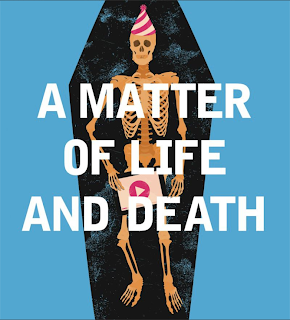 This must-have debut novel by Paul Carroll is a satirical reflection of contemporary Britain. A witty, black comedy with a thought-provoking core. Paul draws upon the age-old saying: “Everybody should be famous for fifteen minutes. After they die” and questions if society has gone too far. Both entertaining and shocking, this book is a perfect present for those looking to add a bit of depth to this year’s Christmas stocking.